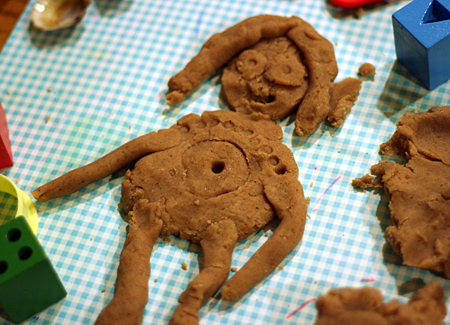 We used our standard homemade playdough recipe. Instead of adding food coloring, we stirred some spices into the flour before adding it to the pot. We used ginger, cinnamon, allspice, and cloves. I did not measure any of it — I basically just let the girls shake, shake, shake till they thought they were done. 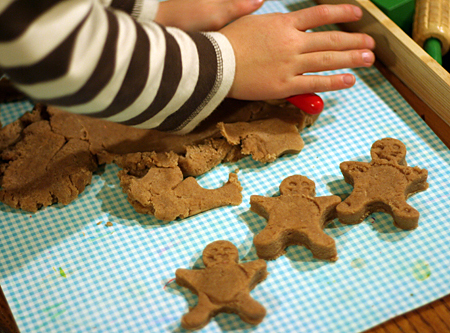 Our flour didn’t look very brown, but once I started cooking the playdough, it looked perfectly gingerbread-y. 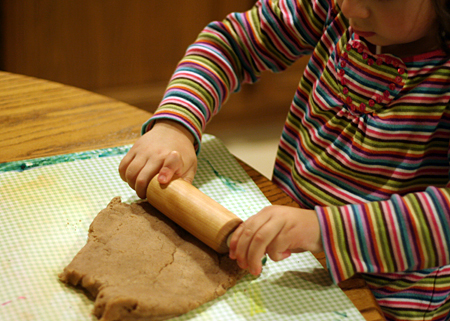 Add a few rolling pins and cookie cutters, and the girls were set for a good, long playdough session. I’m thinking some small containers of this dough paired with a cookie cutter would be great Christmas gifts for the girls’ friends. Thanks for the great idea Amy! I used this as our activity of the day for our advent calendar yesterday and the boys loved it. It was the first time that I have made homemade play dough and it was so easy! I can’t wait to make some more! I used your idea and let the boys dump the spices in the flour. 4yo DS is over there playing with it again right now! Thank you! I just wanted to say thank you for this fun recipe and to let you know I included the link for this on my homeschool blog today. This is very good idea to busy your children. I am anxious to use this with my pre-schoolers. We have made cinnomon oranments but not the playdough. Thanks for sharing!